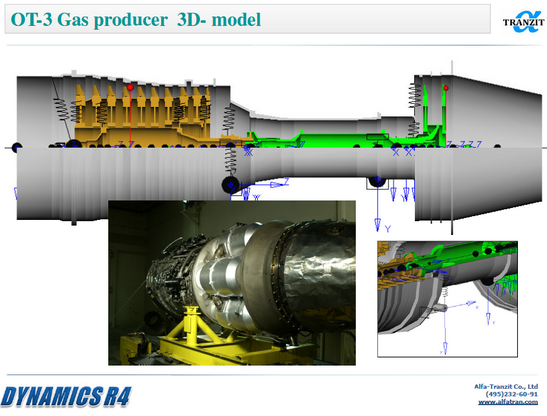 ROTORDYNAMICS OF TURBOMACHINERY, Software and Engineering services, Alfa-Tranzit Co. This software is a mathematical test facility that allows parametric studies and optimization of rotating machinery dynamics. Wide variety of the structure simulating elements and the friendly interface facilitate buildup of accurate system models. The code may be applied to simulation of vibration problems arising in experimental tests and during rotating machinery operation. The simulation results may explain details of the damaging process. The unsteady and non-linear approaches allow simulation of various systems dynamic response. So there arises a possibility to create calculation based diagnostic algorithms without numerous expensive specific tests. Researchers and scientists may create their own elements to simulate non-linear effects. 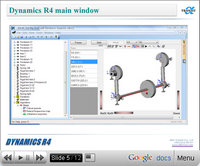 The new elements may be integrated in the Dynamics R4. The code may be used for teaching students the rotor dynamics and for solving educational examples, laboratory practice support, etc. Students also may use the S/W for self-instruction purposes.